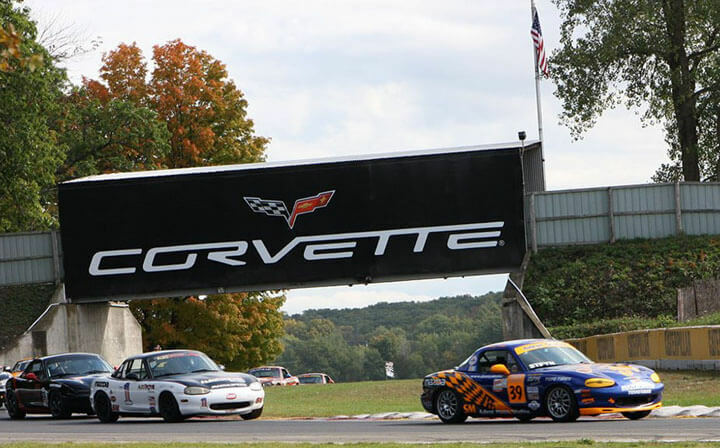 Home / Years / 2011 / Steyn leads the 2011 SCCA Runoffs, gets punted off while running in 3rd place, recovers to finish 5th! 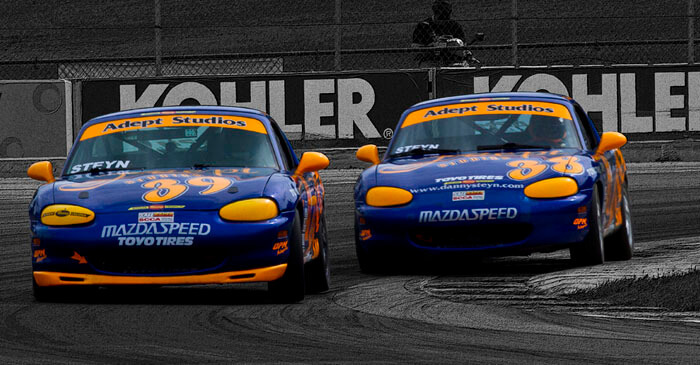 The 2011 SCCA Spec Miata Runoffs was a race filled with high drama from beginning to end. The track was still damp in areas and wet between the kink and Turn 13 from the mornings rain when the 34 spec Miata’s left the false grid. Jim Drago, who had led all the qualifying sessions, led the field through Turns 1 through 7 but was knocked off the track in contact with Steve Gorriaran (2009 Champ). Rossini driver Danny Steyn took the opportunity to jump into the lead but he lost it in the kink in the wet and slipped back to 2nd place at the end of lap 1. Coming into T5 on lap 2 Andrew Charbonneau (2010 Champ) bump drafted Steyn back into the lead, but the race went FCY due to carnage in the kink. On the restart Steyn was passed by Gorriaran and Elivan Goulart. Over the next 8 laps they had a ding-dong race up front with Steyn and Charbonneau in close contact in 3rd and 4th. On lap 11 Steyn was knocked off track in contact with Voytek Burdzy. Sammy Valafar came from way back and made a charge to the front. The finishing order was Goulart, Gorriaran, Valafar, Charbonneau, Burdzy and then a trio of Rossini drivers, Chip Van Vurst, Steyn and Alex Bolanos. Van Vurst had the charge of the day driving from last place to finish 6th on track. After tech and protests were complete the final podium was Goulart (2011 Champ), Charbonneau, and Burdzy. Van Vurst, Steyn and Bolanos finished 4th, 5th and 6th respectively. 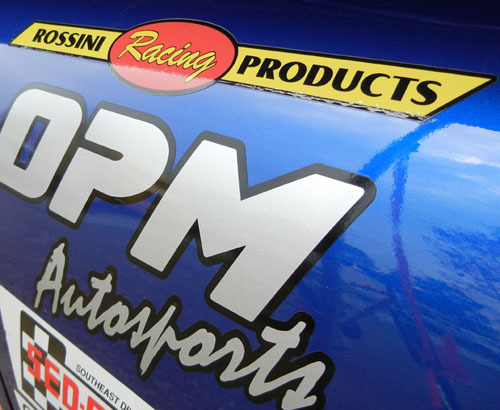 Steyn was also one of only 3 drivers to beat the previous Spec Miata lap record time! 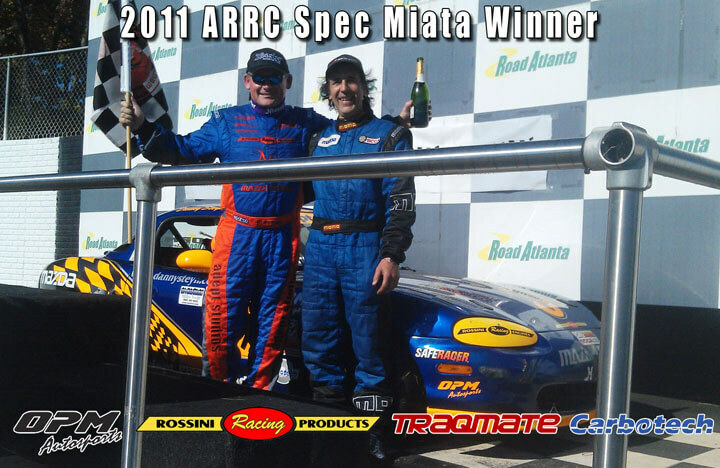 Danny Steyn Racing salutes Elivan Goulart as the 2011 SCCA Runoffs Champ, and salutes all the drivers that showed up and competed in this tough event.